WASHINGTON TWP.  Local impressionist painter John Stinger will showcase his work at Warren County Community College with an upcoming art show, funded by the Investors Savings Bank Foundation. Stinger's Plein Air Impressions will be showcased from late March through early April. Stinger, who is a former student of the college, specializes in New Jersey, Pennsylvania, and New York landscapes, river, and snow scenes, but has traveled the world looking for the perfect painting locales. A Trenton native, he has been involved in art all his life, winning a poster contest in his teens, selling cartoons to national sports and consumer magazines, and receiving a full art scholarship after being noticed by a high school art teacher. 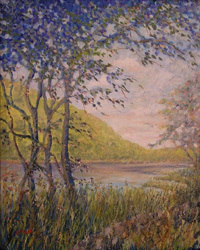 He has learned to tell a unique story in each of his landscapes and has a special place in his heart, and paintings, for the Delaware River. This showcase is one of a number of several college related arts shows being funded by a grant from the Investors Savings Bank Foundation. The goal of the program is to feature artists from the area. In addition to promoting artists, the grant also includes free art lessons for local residents.